Dr Sharon Ufberg, Dr. Sharon Ufberg is a freelance writer, entrepreneurial coach, founder of Borrowed Wisdom and hosts Force of Nature on NPR’s 51% radio. Every now and then, an unexpected and delightful experience comes along, seemingly by chance, that is life affirming and simply wonderful. That’s precisely what happened when my daughter and I took off for a mother-daughter weekend in Victoria, BC recently. By choosing a particular hotel we fell into an opportunity to seamlessly support a partnership that’s creating positive global impact one hotel room at a time. In fact, as soon as we read about Delta Hotels partnership with Soapbox Soaps we knew immediately that we wanted to stay in one of their properties during our trip to Canada. So here is the story; Delta Hotels provides the Soapbox bath products to their guests and Soapbox in turn, donates soap to communities in need. The non-profit Soapbox was founded on the mission to empower consumers to change the world through every day purchases. Their soaps are made in the USA and distributed worldwide. The collaboration between Delta Hotels and Soapbox is pretty incredible. In 2018 alone, they will provide an estimated 1.4 million bars of soap to communities through Soapbox’s buy-one-give-one model. What is even cooler is that each hotel room amenity kit (soap, shampoo, conditioner, body lotion, body wash) includes a unique “hope code.” Guests of Delta Hotels may enter the hope code found on their individual in-room amenities on Soapbox’s website, to see where that particular kit’s contribution will be allocated. Our particular kit benefits the neighboring villages in Mumbai, India. The work there includes launching hygiene stations and facilitating soap recycling demonstrations for the community in addition to providing the soaps. Not only did these naturally derived soap products feel good to use but they gave us an opportunity to be part of a positive change in the world with our stay. How fantastic is that? 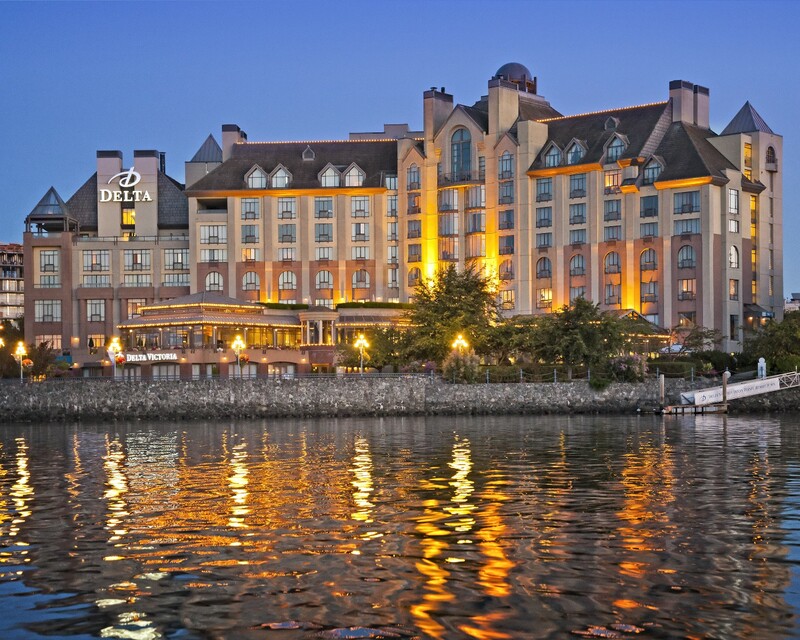 And as it turned out, the Delta Victoria Ocean Point Resort hotel was located in the perfect spot to take in the harbor views of boats going out, sea planes landing and water taxis motoring by. The spa and restaurant were total winners too! We loved every minute of our weekend in Victoria, BC. Another big bonus was wandering into the lovely Bernstein & Gold boutique and finding my mother-of-the-bride’s dress. Just a perfect weekend getaway! Dr. Ufberg is a radio host and freelance journalist who writes and talks about human spirit, people and places that make a difference, women, musicians and philanthropic initiatives.She creates and teaches online personal growth courses and privately coaches individuals as the senior consultant for Borrowed Wisdom and Good Advice Works, companies she created to assist people to turn their dreams into reality.